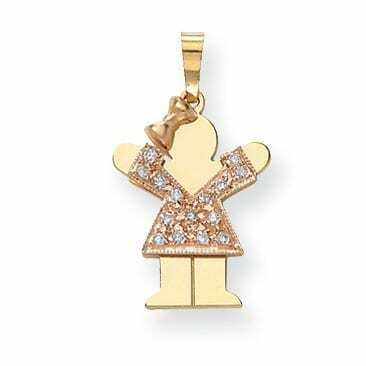 A child’s spirit preserved in a captivating charm proudly displayed on a spectacular bracelet or necklace. Whether adorned with one charm or several, a glance at the wrist or a touch to the neckline should evoke a feeling of love, a swell of pride and by all means, a smile! That was my vision when I created the KIDS Collection at Rona K. Corp, and I am happy to say, over the years, I’ve seen the joy on so many mothers’ faces as they proudly showed off their “kids” represented in 14-karat yellow gold, white gold, rose gold, tri-color & two-tone gold or sterling. Whether you are a son or daughter creating a gift that shows how much you love your mom, a dad crafting a keepsake for the mother of your children, or perhaps a mom yourself fashioning a memento of your children for their grandmother, a customized necklace or bracelet from The KIDS Collection by Rona K Corp is a thoughtful gift. Not only because it represents a mother’s love, but also because you had a hand in designing it. 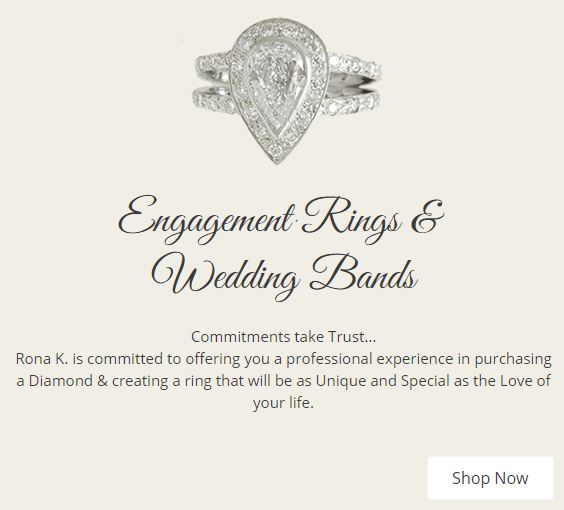 If you’re concerned that you are not an artist or jewelry designer, Rona K Corp has made it easy for you to choose and of course, our design team is with you every step of the way to answer your questions and assist with your selections. 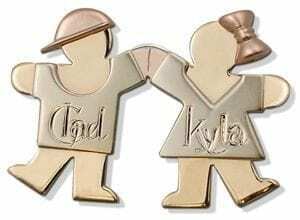 The KIDS Collection features boy and girl charms reflecting distinct personalities through hugs, kisses, love, and joy. 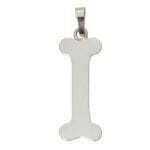 You can decide which charm best reflects each child included in your design. 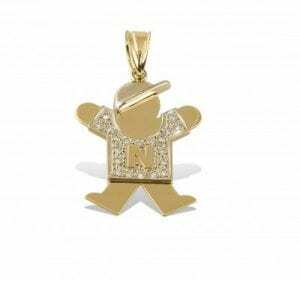 For the first-born child, the kid-size charm (1.13 inches tall) is ideal, the half pint size represents the second child, with quarter pint-size charms for the third, fourth and so on. 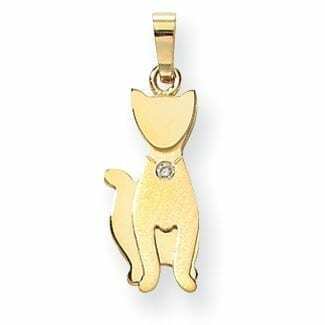 At Rona K. Corp, our pets are family, so it should come as no surprise that we offer pet charms so the “four-legged kids” in your family can be included, if you desire. With birthstones, diamonds, and spacers available to enhance any design, our team will work with you to craft a truly unique piece of jewelry. Don’t forget, charms can be added as a family grows. And even when completed, the jewelry can become a family heirloom passed down to the next generation as a keepsake of their youth. Mother’s Day is Sunday, May 12th – so, take a moment and return to our homepage then click on “Meet the KIDS.” After you see our beautiful charms, you’ll understand why this sentimental & sophisticated collection has been embraced by mothers around the world. While we’re on the topic of thoughtful gifts, check out our KIDS Collection cuff-links, tie pins, tie chains and tie-tacks for dads and grandpas. After all, Father’s Day is coming up on Sunday, June 16th. As Founder & President of Rona K. Corp, I am proud to share with you my inspiration for The KID’S Collection, and my American Dream Story, which includes my children now entering the next generation of our family jewelers. How’s that for a perfect Mother’s Day gift? Having worked for years in my dad’s store, there was an obvious void in the jewelry industry for beautiful gold charms to represent the most precious moment of a family’s life: the birth of their children. The KISS Boy and Girl charms were born, and they won International Recognition 2nd Place in The Modern Jeweler Magazine. Thus, we began manufacturing the KIDS Collection and as our customer’s families grew, so did our designs. Our customers lovingly declared a need to celebrate not only their two-legged children but their four-legged family members, too. 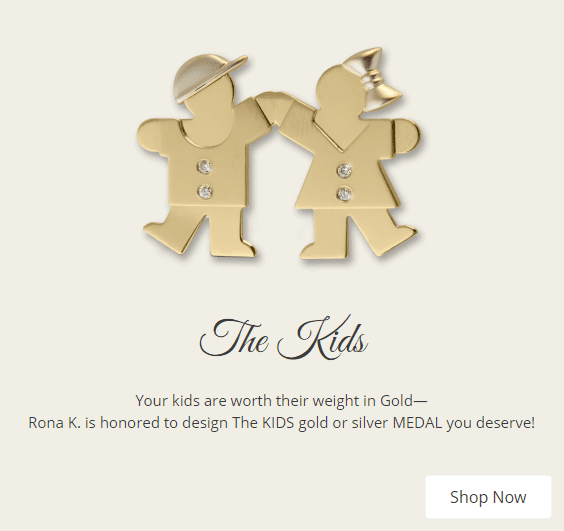 Rona K. Corp created a new collection of charms, The PETS™, to hang side-by-side with The KIDS™. Over the years, Rona K. Corp has expanded our jewelry lines to include Cuddles, Soul Mates, Hearts, and most recently, Initial Bracelets & Heart Spacers. We are a family business specializing in family jewelry, and we look forward to working with your family soon! Now that the holidays have passed, the fashion season arrives with the kick off of New York Fashion Week on February 7th. As a jewelry designer, I enjoy seeing the shape, form, color/value, and texture of apparel brought to life on the runway. And while the latest fashions will be fleeting (specific to Fall/Winter 2019), I take great pride in knowing jewelry worn to complement these styles will withstand the test of time. At Rona K. Corp, the jewelry we’ve designed is intended to be a reflection of eternal love, family and tradition that spans generations. Worn by mothers, fathers, grandmothers, and grandfathers, our treasured charms add a shimmer of precious gold or sterling silver to any style, along with a story to tell to all those who admire the jewelry. With an option to choose personality styles for each child as well as diamonds or birthstones for added sparkle and meaning, the ability to craft jewelry specific to each unique family is a feat we are proud to have accomplished. On sale for a limited time, the KIDS Collection offers necklaces and bracelets that can be customized to reflect each unique family. 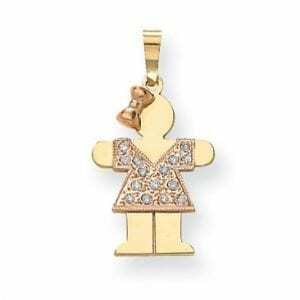 Ideal for moms and grandmothers, all it requires is the choice of a charm to represent each child (and pets, if you so desire) to create a truly personalized piece. 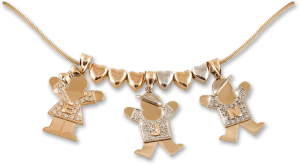 As time passes, charms can be added, or additional bracelets or necklaces were given to” the KIDS” who are now starting their own families and another generation of tradition. Whether for yourself or your spouse, begin building your wearable family tree in 2019 with 20% OFF the KIDS Collection for a limited time. 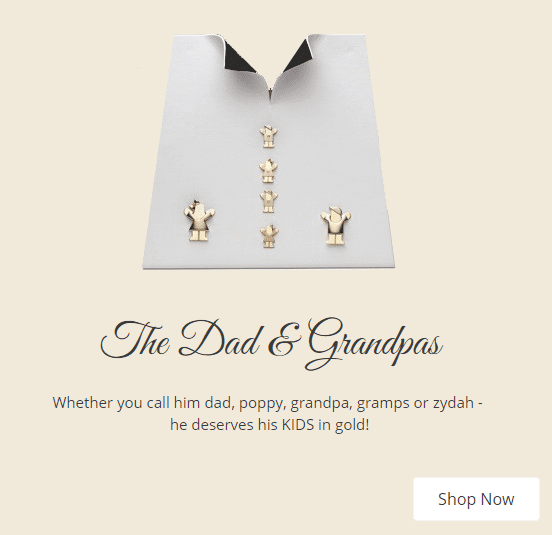 Our Dads & Grandpas Collection also boasts a beautiful array of 14k Gentlemen’s KIDS Stud & Cufflink Sets, Tie Chains, Tie-Tacs and Lapel Pins that can be customized to reflect each child in the family. Serving as a constant reminder of what matters the most, so many “family men” have told us they truly appreciate the availability of a sentimental jewelry line specifically for men. Click to browse items on sale, and if a marriage is “on the horizon” in 2019, check out our spectacular selection of wedding bands and engagement rings to be inspired! At Rona K. Corp, we look forward to exceeding your expectations while helping you celebrate the joys of your family throughout the years. If you’re like me, you’re a “giver” who finds great joy in giving gifts to loved ones that are thoughtful and meaningful. From stunning necklaces, family charms, and beautiful bracelets, to engagement & wedding bands (perfect for popping the question and getting married during this most festive of seasons), Rona K. Corp provides personalized pieces to not just decorate but celebrate for a lifetime! Offering inspired gift ideas to help you “cross everyone off your list,” Happy Shopping and Happy Holidays from Rona K. Corp.
For mothers and grandmothers, the perfect gift recognizes and remembers what matters most: families & precious moments through unique personalized jewelry. The hallmark of our original gold and silver designs in our signature KIDS & PETS collections, allows you to start a family tradition that will span generations. 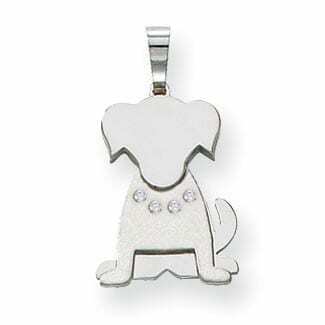 Simply choose a necklace or bracelet then add charms that reflect the personality of the children (and pets) of your loved one. As the years continue, charms can be added, or additional bracelets or necklaces given to” the KIDS” who are now starting their own families. Many of our clients have told us, Rona K Corp KIDS have become treasured family possessions that bring constant joy to every generation. Click on Our Collections to shop the KIDs and PETS Collection today. As our “gift to you,” select items from THE KIDS Collection is offered at 30% OFF during the holiday season using the code FALL30. Spending time in my own father’s jewelry store as a child, as well as growing up in the industry, I found (contrary to popular belief) that many men appreciate a sentimental gift that speaks from the heart and expresses a father’s love or a grandfather’s love. That’s why I created the Dads & Grandpas Collection. It’s an inspired gift idea that allows you to choose one or more Quarter Pint or Half Pint KIDS to be attached to a 14K White Gold Tie Chain proudly displayed on a personalized monogram tie. Prefer a lapel pin, tie tac, or tie studs & cufflinks? We offer those too! Browse personalized men’s jewelry at Rona K. Corp. Unlike electronics & technology often tossed aside when “the newest version” arrives, a personalized gift from the Dad’s & Grandpa’s Collection will last a lifetime. Amid the glow of candles and sparkling lights, many romantic souls choose the holiday season to get engaged or married. 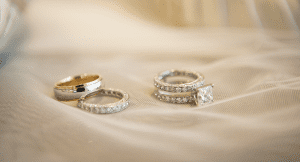 At Rona K. Corp, we offer a professional experience in purchasing a diamond and creating an engagement and/or wedding ring that will be as special as the love of your life. Whether engagement rings, three stone rings, wedding bands, engagement sets, eternity wedding bands, wedding band sets, fancy rings or men’s rings, we hope you “invite us” to help you craft your symbol of eternal love. Click Shop Now to be inspired! At Rona K. Corp, we are proud of our jewelry creations and we look forward to providing you and your family with pieces that are unique as you and your loved ones. As we near the end of 2018, and look forward to 2019, the entire staff at Rona K. Corp wishes you a wonderful holiday season and a happy, healthy and prosperous New Year! It today’s world, families are often spread apart, sometimes by a few miles or quite often by a hundred to a thousand miles or more. Throw in busy schedules and the chance for quality time spent with family has become challenging. 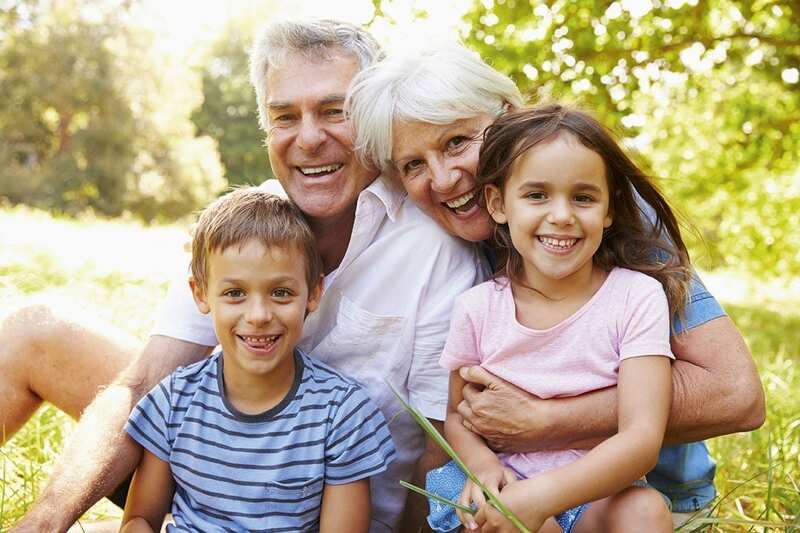 While as parents and grandparents we strive to maintain our emotional connection to the family through periodic visits, phone calls, video calls, and social media, it’s hard to replace the daily joy of hugging a loved one! While I can’t put you within arm’s reach, I am proud to say my Rona K. Corp KIDS Collection has helped many people reclaim an emotional connection; and I revel in the joy of hearing their stories. Here’s are just two personal accounts to illustrate how RKC KIDS have found a place in so many hearts. The first comes from Sharon, who is pictured below with her lovely family! This is my “Kids” story. I received my first charm sixteen years ago. My mother-in-law had a necklace with her grandchildren charms. I have four children – when my oldest daughter gave birth, she gave me my first “Kids” charm to continue the tradition. I wore it all the time. I was teaching Spanish at the time, and when I wanted to emphasize a point I would point to my charm and ask the students “would Sam understand?”. The students would point to the charm to answer. Sam liked to play with his charm when he was little – he was fascinated by the idea that it was his charm. The original charm was followed by eight more. Each child had his own charm. 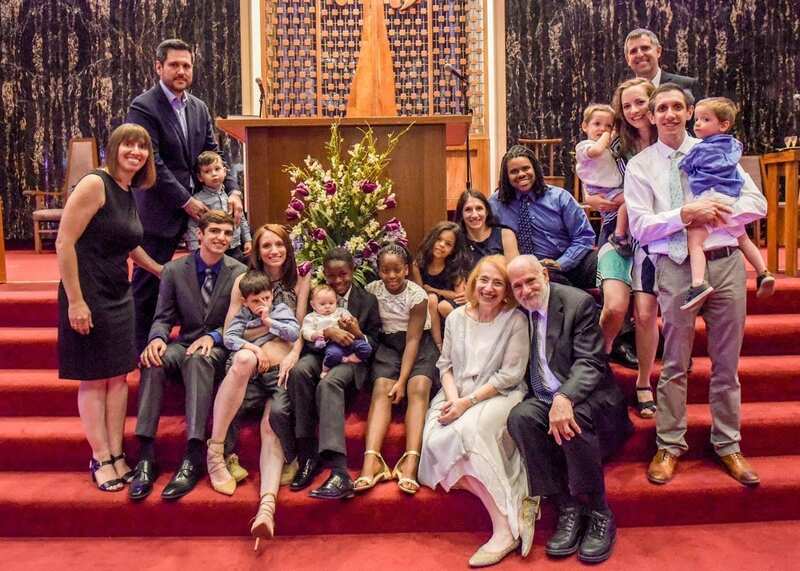 As there are four kinds of “Kids” and there were four families, each family has their own kind of “Kids” charm – and that works out perfectly. The grandchildren love to play with the charms and touch the charms to say who each one represents: Sam, Henry, Sophie, Melania, Simon, Elliot, Theo, Cam, and Isaac. When they were small, each would ask “Which one is me?” It made them so happy to know that I always had them with me. People always notice my necklace, and it is a conversation starter. I have been asked many times where the charms come from because they are so pretty. I love having my “kids” with me and I can’t wait to add my next one in January! As the creator of RKC Kids, Sharon’s ability to maintain an emotional connection to her family through my designs and creations is truly rewarding. 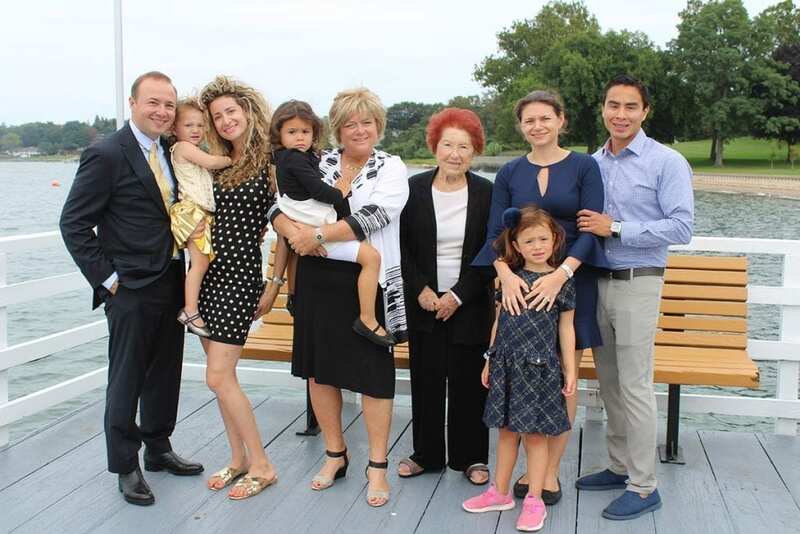 For most clients, RKC Kids has also become a family affair that spans generations, as you can clearly see when reading Sharon’s story! In 1990 I started collecting the Rona K Corp KIDS charms. At that time I had all 7 of my grandchildren ranging from 10 to 20 years old. I decided that all my grandchildren should be in pave’ diamond dresses and shirts. 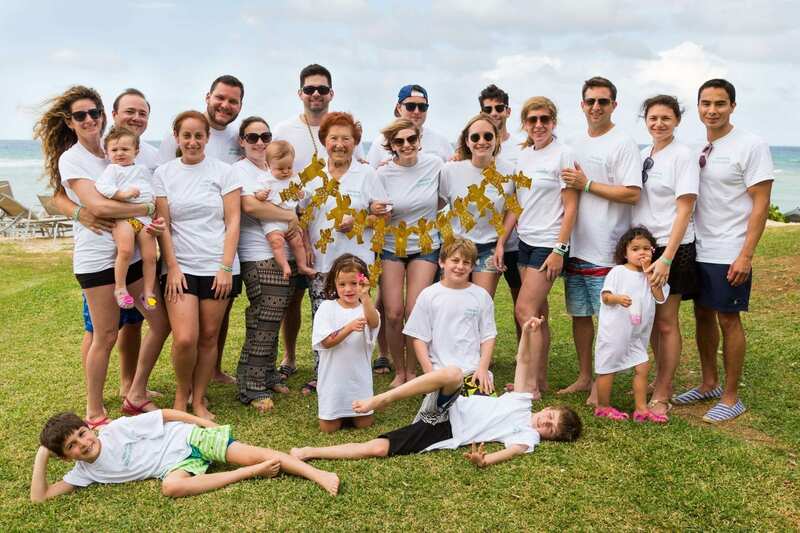 Each of my grandchildren loved to see my necklace and always knew exactly which Rona K KID they were because I put all the grandchildren in age order, not by families. As my grandchildren got married I added the newlywed spouse to my necklace. They all had one diamond in the dress or shirt! Then as these beautiful children began to make me a great-grandmother…well, I had to add the great grandchildren to my necklace, and of course, with pave’ dresses and shirts. My great grandchildren would play with the necklace on my neck as infants and as they grew older they would also know exactly who was who. When another child was born, they would remind me to add their brother or sister or cousin to my necklace. It was so cute and heartfelt that they themselves were so connected to me through this piece of jewelry. With a necklace like this, you do not go unnoticed. I am stopped everywhere I go when I am wearing this necklace, both because it is so beautiful and also because people want to know about all these KIDS on my neck. I am so proud to show off my KIDS necklace but mostly to be able to speak of my grandchildren because they are here with me every day of my life and very close to my heart. My thanks to Shirley and to Sharon for sharing their stories. Created to recognize and remember what matters most (family & precious moments), Rona K. Corp designs and creates your expressions of love and hope with unique personalized jewelry. As a Jeweler in New York catering to a worldwide clientele, the hallmark of our original gold & silver designs is our signature KIDS series. 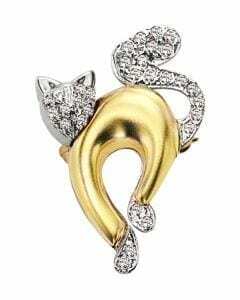 Click on “Our Collections” on our homepage to discover your precious KIDS in gold, silver, pave’ diamonds and more; and don’t forget to check out The PETS to include your 4-legged family members. It’s a loving tribute to their unconditional love. Contrary to what advertisers may want you to believe, Dad really doesn’t want power tools on Father’s Day and neither does Grandpa! And if you think electronics or gadgets are the way to go, they’ll only be tossed aside when it’s time to upgrade then forgotten fast! Spending time in my own father’s jewelry store as a child, as well as growing up in the industry, I know firsthand that most men appreciate a more sentimental gift. Something that speaks from the heart and expresses a father’s or a grandfather’s love. That’s why I created the Dads & Grandpas Collection featuring Rona K. Corp’s KIDS. Reflecting different personalities such as hugs, kisses, love and joy, you can choose the “charm” or “charms” that best represents the personality of each child in the family, then allow Rona K. Corp to craft them into fine pieces of unique jewelry Dad and/or Grandpa will consider a family heirloom. Absolutely ideal for Father’s Day, browse The KIDS website and choose one or more Quarter Pint or Half Pint KIDS to be attached to a 14K White Gold Tie Chain proudly displayed on a personalized monogram tie. Whether you call him Dad, Poppy, Grandpa, Gramps or Zydah, let us know what you’d like embroidered on the tie, and what color your “special man of the day” would like – black, baby blue or pink. Finally, a tie Dad will proudly wear with THE KIDS displayed for all to see. There are so many ways to give a family man what “he really wants” with the Dads & Grandpas Collection featuring The KIDS. For a man with one child, the boy or girl lapel pin, tie tac or tie chain is a lovely choice. 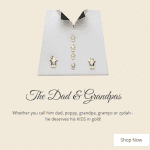 For a father a two, why not choose a pair of cufflinks? Whether two boys, two girls or a boy and a girl, we can mix and match. For the dad with an entire brood, the Tie Stud & Cufflink Set is something he will treasure every time he dresses in his best for a special event. Just a few examples of what we can do, we are able to create timeless pieces that suit Dad’s or Grandpa’s unique family dynamic. Choose from 14K white gold, yellow gold, rose gold, tri-color gold, two-tone gold, or sterling silver. Add diamonds or birthstones for an even more dazzling embellishment. Whatever your desire, we can make it happen. Happy Father’s Day from all of us at Rona K. Corp! As Founder & President of Rona K. Corp, I am proud to share with you my inspiration for The KID’S Collection and my American Dream Story, which includes my children now entering the next generation of our family jewelers. We design and manufacture beautiful engagement rings, wedding bands, stunning necklaces, family charms and beautiful bracelets. Proud of the excellent reputation we’ve built since Rona K. Corp was established in 1973, we invite you to learn more about us and to read our customers reviews: https://ronakcorp.com/testimonials. Thank you to all those who serve to give us FREEDOM!